The Villiger Selecto Connecticut 5 Cigar Fresh Pack is tagged with free shipping. If you order this product, your entire order will receive FREE BCP Ship Saver shipping! Straightforward, satisfying, and slow-burning, Villiger Selecto Connecticut cigars offer warm tones of creamy cedar, toasted bread, and mellow, medium bodied tobacco taste with subtle hints of citrus. A golden Connecticut leaf grown in Ecuador adorns this expertly handmade blend of flavorful Nicaraguan tobaccos to bring you a laid-back luxury smoke at a reasonable price. These resealable 5-cigar Fresh Packs come with built in humidification, simply reseal between smokes and there’s no need to take up space in your humidor. Wow!I love it.Creamy,loads of smoke,nice even burn,wrapper seams to be well aged.I think I've found my favorite Connecticut.Thank you BCPfor this 3 sampler pack intro for such a great price!I can't wait to try the other 2 mad&habano.Grab some at this deal,you won't regret it! Good smoke, smooth draw, nice quality. 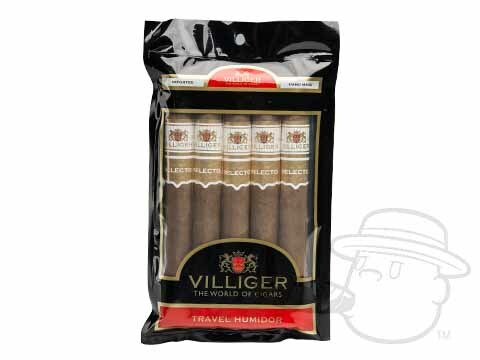 Villiger Selecto Connecticut 5 Cigar Fresh Pack is rated 4.5 out of 5 based on 9 customer ratings.